This week’s image of the week is this daytime shot of three deer, two does and one buck walking through the clearing that my trail cam was in. This week’s image of the week is….. 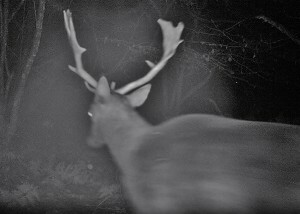 This very large Fallow buck came through the path really close to my trail cam. Come back next week to see the next “Image of the Week”! Each week I plan to post the best footage from my camera trap. This week we noticed this young deer seems to only have one antler. Still has the downy fuzz on it too. I called it the ‘Rhino Deer’. I chose this because it is very interesting and unique.